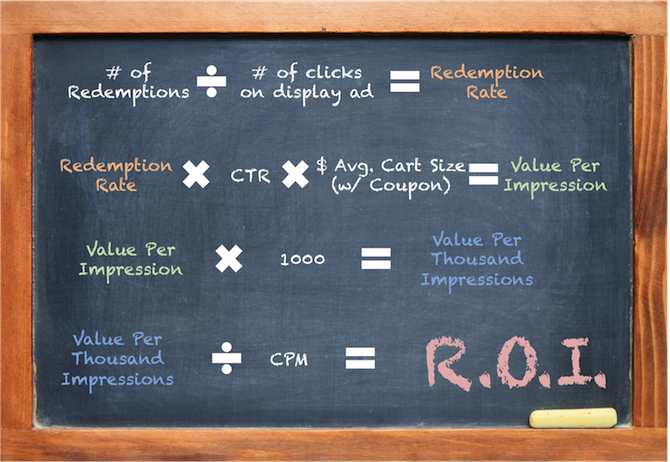 Here’s a straightforward ROI formula for calculating your returns from mobile ad campaigns that feature integrated coupons. 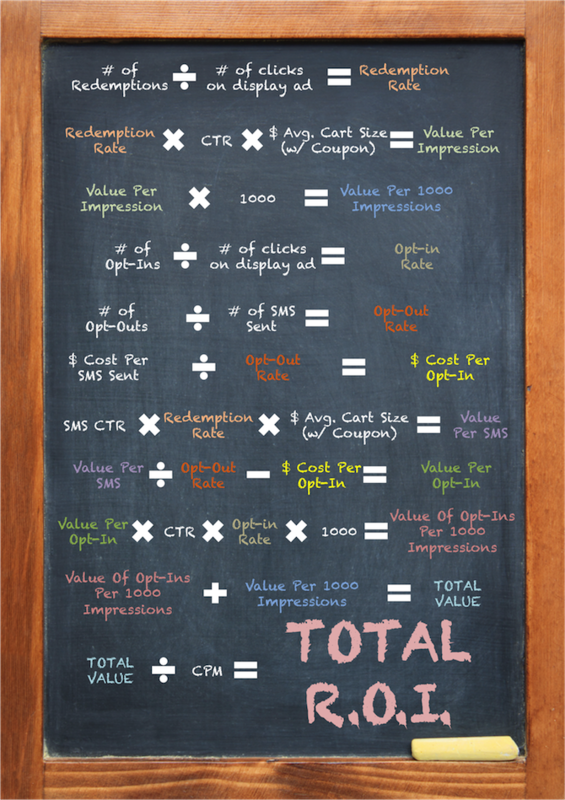 We’ll be posting additional ROI formulas down the road to help you calculate the value of different types of mobile ad campaigns. There are a lot of methodologies out there for calculating the value of mobile coupons, but we’ve chosen a relatively simple one that should work for almost anyone. Driving foot traffic to participating locations. The right coupon, served during optimal hours, to a precise geo-targeted mobile audience is essentially guaranteed to reach people who are already out running errands. Prompting social share (who doesn’t love sharing good deals with friends and family?). In our recent study on Advertising to Millennials, we found that 49% of young americans are sharing mobile coupons socially. Growing a mobile opt-in list. Monetary incentives like coupons are the single most powerful way to encourage consumers to sign up for ongoing re-engagement from SMS or Email marketing campaigns. Increasing conversions at point of sale. This goes without saying: just like print coupons, mobile coupons incentivize additional purchases and upsell to increase average basket size. Mobile coupons, however, do a significantly better job of it—boasting 10x the average redemption rate of print coupons. Essentially, proving ROI with mobile coupon ad units involves comparing the CPM (Cost Per Thousand Impressions) of a campaign against the average value per thousand impressions. Unlike more abstract metrics like brand value, coupons drive conversions with a measurable dollar amount, and as such it’s fairly straightforward to attribute their value. 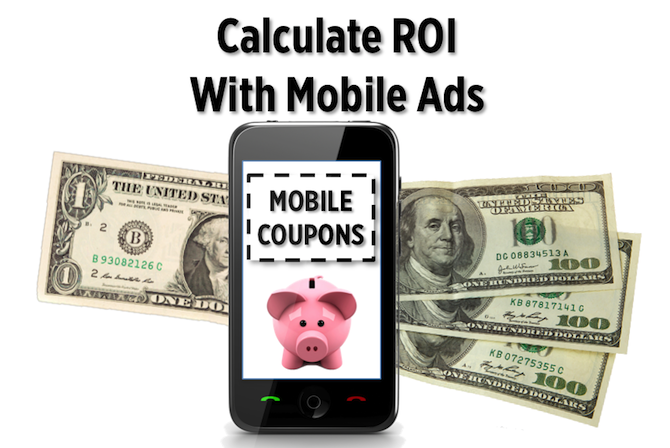 This simple ROI formula will help you calculate the value of a mobile display ad that clicks through to a redeemable mobile coupon. Like I said, that was just to calculate ROI for the most basic version of a mobile coupon ad unit. If you really want to maximize returns, you should incorporate a Mobile Opt-In feature that lets consumers voluntarily subscribe to receive additional offers via email newsletters or SMS Marketing. A simple call to action on your landing page like, “Sign Up For More Offers!” is all it takes. FunMobility allows you to manage all these features under one platform. 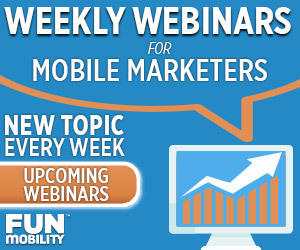 Mobile rich media ads with integrated SMS opt-in deliver long-term returns. Here’s the ROI formula to calculate those returns.